Americans are spending more on their homes. And it's on a lot of things -- from small improvements like new faucets and lights to big-ticket items like roofs, counter tops and dishwashers. The largest home improvement store in the country, Home Depot, said Tuesday that sales for those more expensive items -- the ones over $900 -- rose by almost 8% from the same period last year. When people make pricy purchases, it's a sign that American consumers are feeling confident about the economy and where it's heading. Overall, sales at Home Depot (HOME D) stores open a year or longer in the U.S. rose 7.3% compared to a year ago. The company's overall sales -- $21.8 billion -- were up 6.4%. "There's a lot of momentum in the U.S.," Carol Tome, Home Depot's chief financial officer, said in a conference call Tuesday. There's been some concern about whether Americans are loosening the purse strings in 2015. Overall, Americans are buying a record amount of cars, and are going out to restaurants. But sales at department stores and electronics stores have been down recently. However, there is momentum building in the U.S. housing market. Sales of new homes have been higher this year compared to last year, and sales for existing homes hit a pre-recession high in September. Those trends bode well for Home Depot and other home improvement companies. 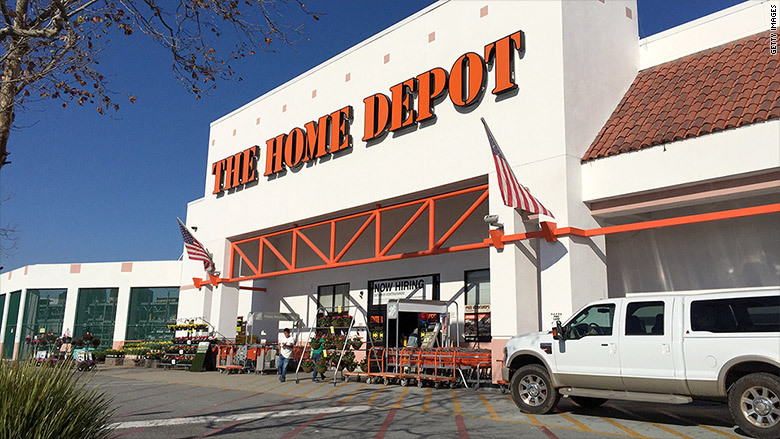 Home Depot's stock bounced up 4% Tuesday morning. Home Depot is up 28% over the past 12 months. Shares for Home Depot's biggest U.S. competitor, Lowe's (LOW), are also up about the same over the past year. It's not all good news though. Home Depot has stores in Mexico and Canada, where the strong U.S. dollar is hurting its sales. Home Depot execs estimate that the strong dollar will cost the company $1.4 billion in sales by the end of the year.